Manufacturer: Dr. Reddy's Laboratories Ltd.
10% 60ml × 1 solution $ 85.95 $ 85.95 Buy Now! 10% 60ml × 2 solution $ 75.47 $ 150.95 Buy Now! 10% 60ml × 3 solution $ 72.98 $ 218.95 Buy Now! 2% 60ml × 1 solution $ 34.95 $ 34.95 Buy Now! 2% 60ml × 2 solution $ 29.98 $ 59.95 Buy Now! 2% 60ml × 3 solution $ 25.98 $ 77.95 Buy Now! 2% 60ml × 6 solution $ 24.32 $ 145.95 Buy Now! 5% 60ml × 1 solution $ 51.95 $ 51.95 Buy Now! 5% 60ml × 2 solution $ 49.48 $ 98.95 Buy Now! 5% 60ml × 3 solution $ 47.32 $ 141.95 Buy Now! 5% 60ml × 6 solution $ 45.16 $ 270.95 Buy Now! The exact way that MINOXIDIL works is not known. It is possible that it dilates blood vessels in the scalp, which may improve hair follicle function and stimulate hair growth. 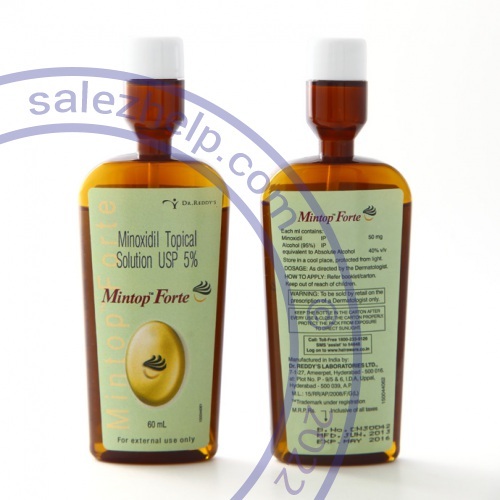 Minoxidil is used to treat pattern baldness in patients who are experiencing gradually thinning hair on the top of the head. Minoxidil may also be used for purposes other than those listed in this medication guide. Minoxidil is in the FDA pregnancy category C. This means that it is not known whether Minoxidil will be harmful to an unborn to baby. Do not use Minoxidil without first talking to your doctor if you are pregnant or could become pregnant during treatment. Minoxidil may affect a nursing baby. Do not use this medication without first talking to your doctor if you are breast-feeding a baby. Use Minoxidil exactly as directed by your doctor or as directed in the package labeling. If you do not understand these instructions, ask your pharmacist, nurse, or doctor to explain them to you. Dry your hair and scalp before applying Minoxidil. Apply the prescribed amount, usually 1 mL, to the affected areas of the scalp. Minoxidil is usually applied twice daily, in the morning and at night. Wash your hands after applying Minoxidil. Avoid getting Minoxidil in the eyes, nose, or mouth. If this occurs, rinse the area with water. Do not use Minoxidil if the skin on your scalp is damaged, irritated, or sunburned. This may allow more of the medication to be absorbed by your body, which could be dangerous. Do not use more than 2 mL of Minoxidil in one day. More medication will not increase or hasten hair growth but it may cause dangerous side effects. Do not use Minoxidil on any part of your body other than your scalp. Application to other body parts can be dangerous. If no hair growth is seen after 4 months of treatment, discontinuation of Minoxidil should be considered. Store Minoxidil at room temperature away from moisture and heat. Use the missed dose as soon as you remember. However, if it is almost time for the next dose, skip the dose you missed and use only the next regularly scheduled dose. Do not use a double dose of Minoxidil. An overdose of Minoxidil is not likely to occur. If an unusually large dose is applied, or if the medication is ingested, seek emergency medical attention. Symptoms of a Minoxidil overdose are not known but may include very low blood pressure (fainting, dizziness, confusion); an irregular or fast heart rate; headache; and flushing (redness, warmth) of the skin. Do not use other topical products on your scalp during treatment with this medication, unless otherwise directed by your doctor. Drugs other than those listed here may also interact with Minoxidil or affect your condition. Talk to your doctor and pharmacist before using any prescription or over-the-counter medicines, including herbal products. Do not donate blood while you are taking this medicine. This will prevent giving this medicine to a pregnant female through a blood transfusion. Ask your doctor or health care professional when it is safe to donate blood after you stop taking this medicine. Contact your doctor or health care professional if your symptoms do not start to get better. You may need to take this medicine for 6 to 12 months to get the best results. Women who are pregnant or may get pregnant must not handle this medicine. The active ingredient could harm the unborn baby. If a pregnant woman or woman who may become pregnant comes into contact with a leaking capsule, she should wash the exposed area of skin with soap and water immediately and check with her doctor or health care professional. This medicine can interfere with PSA laboratory tests for prostate cancer. If you are scheduled to have a lab test for prostate cancer, tell your doctor or health care professional that you are taking this medicine.